In early May, the Connecticut capital exhibited several artists and elements of Brazil in a festival dedicated to samba. The event, which takes place annually, was held at the Trinity College campus in Hartford on Saturday, May 6, from 11am to 6pm. The program was filled with exciting Brazilian attractions. This year, the program included Brazilian guitar player Gilvan de Oliveira, who performed together with bass player Ivan Correa da Costa and percussionist Sergio Antonio. In addition to singer Karlibeth Ortega of Honduras, Gideon Ampeire with the sounds of Uganda and the Ginga Brasileira Group directed by Efraim Silva, Samba Fest also showcased Projeto Bossa Nova, the West Hartford High School choirs conducted by Lorri Cetto, the Trinity Samba Band with special guest Jose Paulo and conducted by Samba Fest founder, Eric Galm, the Trinity Steel Band and many other cultural attractions and activities. 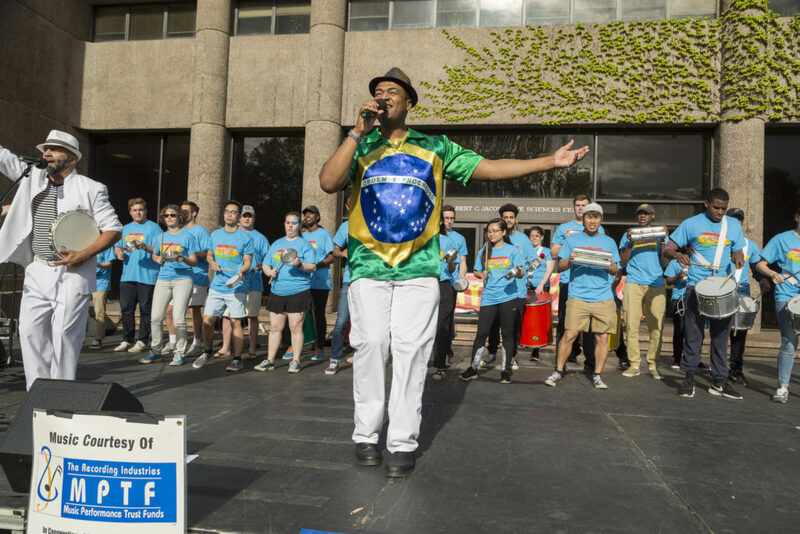 For professor Eric Galm, Samba Fest offers an opportunity to connect two completely different cultures and to intermingle American and Brazilians college students. “This event has a very important meaning to me. I lived in Brazil during my childhood and I feel a deep obligation to promote Brazilian culture. My work is to represent those who do not have a voice. It is extremely gratifying to be able to bring Brazilian culture to an American university,” he emphasized. For 2018, the program is already at full steam with possible changes to the event. “I am considering the possibility to convert this event into a conference so we can not only bring singers, activities and art but also create an environment for dialogue about how these rhythms have influenced people’s lives. I want to be able to attract the attention of American youth and use cultural activities to help deal with social issues in cities,” explained Galm. For more information about Samba Fest, please contact Eric Galm at 860-966-3185.